Some of the parents waiting to receive cash grants. social sector to support members of the populace, particularly those who are less fortunate. Moreover, Government through the Ministry of Education recently commenced an ambitious Cash Grant initiative which translates to the distribution of $10,000 per child attending public schools. This therefore means that children at the levels of nursery, primary and secondary schools since earlier this month have been eligible for the financial support through the newest initiative. The Ministry of Education has already distributed several millions in cash grants and was slated to distribute several more, amounting to $62.5 million, to parents on the Essequibo Coast alone. The grant which Government has titled ‘Because We Care’ was distributed on the Essequibo Coast on Monday with a total of 6,252 parents (guardians) uplifting cash grants on behalf of their school-aged children. The distribution continued yesterday with 2,840 additional grants being distributed. The Essequibo Coast distribution was conducted at 10 sites, each of which served at least three schools in its immediate environs with the exception of Aurora Secondary School, which only serviced parents and guardians from that school. During the Essequibo Coast distribution on Monday, Minister of Education Priya Manickchand conducted a meeting with head teachers and regional officials in order to recap procedural matters and clarify any queries schools might have had with regards to the cash grant. She explained the care in which she expects each officer to treat with the handling and distribution of vouchers and thanked them for working to ensure that each child receives his/her grant. The Ministry is reminding the public that vouchers can only be encashed at Western Union/Bill Express locations, countrywide, by November 30. Almost unanimously parents chose to receive cash as opposed to goods and an overwhelming majority chose to be able to encash at Western Union/Bill Express money services. Where, geographically, there is a limitation of financial services, different arrangements shall be made. 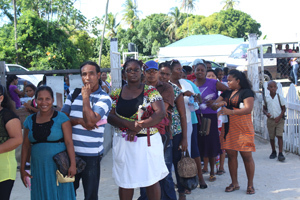 The distribution commenced in Bartica two weekends ago. As explained by the Minister of Finance, this programme is meant to provide more support to parents with school-aged children and increase the disposable income of parents with school age children with a view to raising enrolment and attendance rates. This is in fact the first programme of its kind in the Caribbean and indeed anywhere else in this part of the world, where every public school child is entitled to this benefit. Cash grant distributions have also been done in Regions One, Three, Four and Six, and the process is continuing countrywide.